One of the more ridiculous moments in The Fast and the Furious series (and there are many to choose from) is when the modified Honda Civics drive under an 18-wheeler in the first film. I have always thought that was implausible. It turns out I was right. 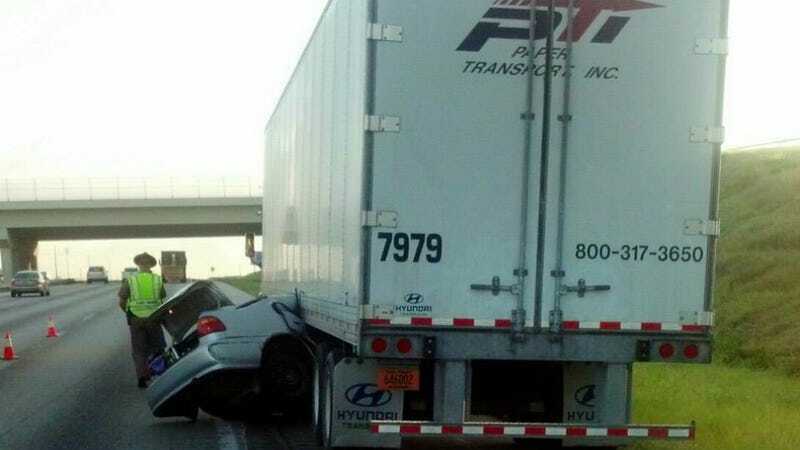 A Civic driver and his passengers in Florida are lucky to be alive after a crash put them under a semi truck, and not in the kind of way where it could zoom underneath like in the movies. They received only minor injuries, which is stunning considering how awful the wreck looks in these photos. Tampa Bay's ABC Action News traffic reporter Meredyth Censullo posted photos of the wreck on eastbound Interstate 4 this morning. She said the driver lost control and veered underneath the truck. I don't think that will buff right out.